It is with sadness the family announces the peaceful passing of Vera on September 29, 2018 at Kildonan Personal Care Centre at the age of 90 years. Vera was predeceased by her husband William (Bill) McLean, grandson Mark McLean, sister Lois Pirt and brother Robert (Bob) Sinclair. She will be forever remembered and missed by her three children and their partners David (Vickie), Jeff (Judy), Sara (Ernie); her eight grandchildren Rogan (Jessica), Wynston, Kristin (Nathan), Matthew (Chrissie), Lindsay (Peter), Jocelyn (Michael), Larissa (Darin), Evan; and her six great grandchildren Alice, Norah, Penelope, James, Poppy and Maren. 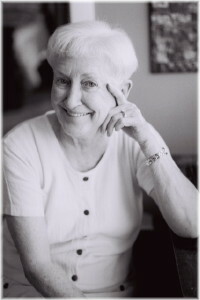 Vera was born on June 23, 1928 in Eatonia, Saskatchewan. Shortly thereafter she moved to Kamsack, Saskatchewan until she was 16 years old, when she and her family moved to East Kildonan in Winnipeg. Upon graduation from high school she worked for the Royal Bank of Canada where she met her future husband Bill McLean. Vera and Bill were married on October 8th, 1949 at John Black Memorial United Church in Winnipeg. Vera and Bill (as a Royal Bank manager) along with their family lived in a number of Manitoba communities including Winnipeg, Brandon, Portage la Prairie, Rivers, Melita, and Beausejour. Eventually, Vera moved to Concordia Village in Winnipeg where she developed a host of new and dear friends, enjoying many hours of laughter with them over funny quotes, table conversations, and events. Vera was ‘art’. She lived and breathed an artistic talent from an early age, writing articles and drawing sketches as a teenager for the local Kamsack newspaper. She grew into a love of art and crafts in all forms, and became proficient and expert in drawing, painting (in oils, acrylics, water colours, pastel and ink), pottery, tole painting, rosemaling, quilting, puppetry, decoupage, weaving, knitting, macrame, batik, and stitchery. Her creations can be found in private homes and businesses throughout Manitoba. Vera opened her own ‘Boodle Shop’ showcasing all her various forms of arts and crafts in Beausejour in 1977, later turning it into a Teddy Bear Museum. While in Beausejour she was known for her window painting on commercial businesses, and as the ‘Teddy Bear Lady’. Vera began collecting and making Teddy Bears in 1969 and at one point had over 600 teddy bears in her collection. She loved to share her passion for Teddy Bears with children and adults alike. She took an active role in all the communities she lived in; as a member of Beta Sigma Phi Sorority and quilting clubs, performing puppet shows, teaching art classes, and numerous other activities. Vera spent many summers at her ‘Cobweb’ cottage in Matlock beach, entertaining friends and family, sailing in her Snark, and continuing to create new art objects and paint. Most of all, she enjoyed spending time with her children and grandchildren, playing and laughing with them during many games and crafts. She took several trips with Bill to Europe and the Caribbean, and after Bill’s passing traveled to Ireland, England, Mexico and China on her own, making new friends in each place. Vera’s sense of humour was evident each day, with her crazy decorations, jokes, and funny quotes she would post for others to enjoy. She leaves a strong legacy of a passion for fun in life. Vera was once heard to quote ‘I Tried to be Normal Once, worst two minutes of my life’. Thank you to Misericordia Health Centre, Concordia Hospital and the Kildonan Personal Care Centre for making Vera’s last days comfortable. Please join us in a Celebration of Life for Vera at 1:30 p.m. on Tuesday, October 9th, 2018 at Sobering Funeral Chapel, 1035 Park Avenue E., Beausejour. Our sincere sympathies to all the McLean family, David, Jeff, Sara and families. We have fond memories of visits to your mom’s house with my girls , Michelle and Stacey, to see the Teddy Bear lady. They had so much fun…i will always remember her smile..she was a fine lady! Sincere sympathies to the family of Vera. She was very proud of all of you and her descriptive stories often were of you. She gave my daughter art lessons and was a great inspiration to her. She was a great lady with great energy and she will not be forgotten. Condolences to the family. I always loved Vera’s stories, all of her creative work plus all of the great laughs that we always had. Her amazing smile and great personality will always be remembered. My sincerest condolences to you David, Jeff, Sara and your families. I will always remember, as a kid, how she wrote my name in big letters on my first golf bag. Funny how certain things just stick in your mind. Auntie Vera, you were always full of fun and laughter. God bless. She will have Bill greeting her up in heaven with open arms. She was a wonderful lady ,full of fun , loads of laughter in Gimli. I have many fond memories of your mom. I had just started a new job and your mom needed my assistance she was so awesome in working with me during my learning curve and I can’t say enough good things about her. I so enjoyed interacting with her – she will be missed. My condolences to you all. My deepest condolences to Sara and your entire family…I knew your Mom for many years! She was a great lady, and I am sure will be missed by many! I will miss Vera’s humor and interesting stories. I was her volunteer driver over the last several years. We had many excursions and “adventures”, many of them remaining as very fond memories. She taught me many “interesting things” and is not forgotten. She was a “treasure”!